After a 24-hour voyage, I made it back in Portland on Friday evening. I have a few more stories about China to share with you over the next couple days, but I will also be looking for other adventures around the Pacific Northwest. More on that in the future. For now, these are my first two impressions about Portland: it has better air and is much more polite than Beijing. The best thing about arriving back in Portland, other than seeing friends and family, is that I can breathe easily again. You cannot see the air in Portland, and that is a wonderful thing. I enjoyed my run yesterday morning because when I took a deep breath, my lungs did not feel like they were under siege. If you breathe the air here all the time, you might not realize that Portland air has a smooth, velvety finish, similar to a fine whisky. 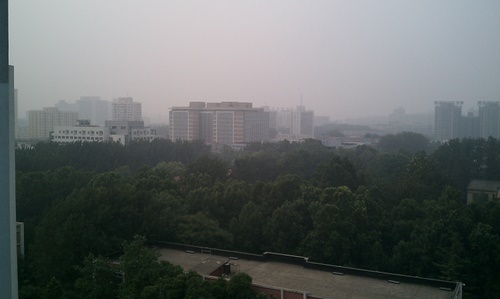 Beijing air is more like a cheap bottle of convenience-store gut-rot. It makes you cough and sputter if you try to breathe too deeply. In addition to having much cleaner air, Portland is also much more polite than China. Sometimes too polite, like when cars unnecessarily stop and wait for you to cross the street. Two days ago, we were out for a walk and went to cross Broadway up by PSU. The light on Broadway was still green, so we waited for cars to pass before starting to cross. Rather, we waited for most of the cars. There was still one car that was in the left-hand lane (the opposite side of the street) who had just about reached the intersection. When I say almost, I mean it couldn’t have been more than 15 yards from the cross street. We stepped into the street on the opposite side, and the driver slammed on her brakes and gave us a dirty look. I gave her a dirty look of my own, raised my hands and waved her through, letting her know that she should have kept going. Maybe I had spent too much time in Beijing, but I was more annoyed that she stopped than I would have been if she had kept going. These are two things that really stood out on my return to PDX. Over the next few weeks, it will be interesting to see how many more differences I see between Portland and Beijing. I imagine there will be many.